The AHL announced the schedule for the 2011-12 season this afternoon at 3PM Central. The season has been shortened from last year's 80 games to 76, 38 home and 38 away. Previously, the league had announced matchups so there are no surprises on who the Stars will be seeing, only dates and times. For the first time in history, Texas will open the season at home, playing host to the Barons on Sunday, October 9th. The home schedule will also close against the Barons on April 14th. The season overall will close on the road at Houston on Sunday the 15th of April. Overall, this schedule feels a lot easier on the team than last year's. The team will face the same number of back-to-back games at 17 but will drop from seven to four 3-in-3s. The season will end in a 3-in-3 as it did last year. Texas's longest road trip is half as long as last year's. From February 14th to 26th, Texas battled it out in eight games over 13 days. This year, Texas will twice head out for four game trips, once in October and once in January. "It's not going to be something that's going to wearing on us," said Coach Pyle. The longest home stand stays the same at seven games, this time in March as the playoff race heats up. Interesting segments in the schedule include the Thanksgiving time frame, which sees Texas play Houston in four out of five games in an eight day period. Milwaukee, which knocked Texas out of the playoffs last year, will not visit the CPC until early February. New opponents on the schedule, Charlotte and Rochester, will both visit Austin in December. And despite it being a Thursday game, I'm pretty sure that November 3rd against Toronto will be a sellout thanks to our Canadian friends here in Austin. The Stars will not play any home day games during the week this year after playing one last year in March. Texas will participate in several day road games, including another 10:45 AM game in Lake Erie. Several good road trip opportunities exist in Stars road games in Houston and San Antonio on Sunday afternoons. What do you see in the schedule? Where are the rough points? 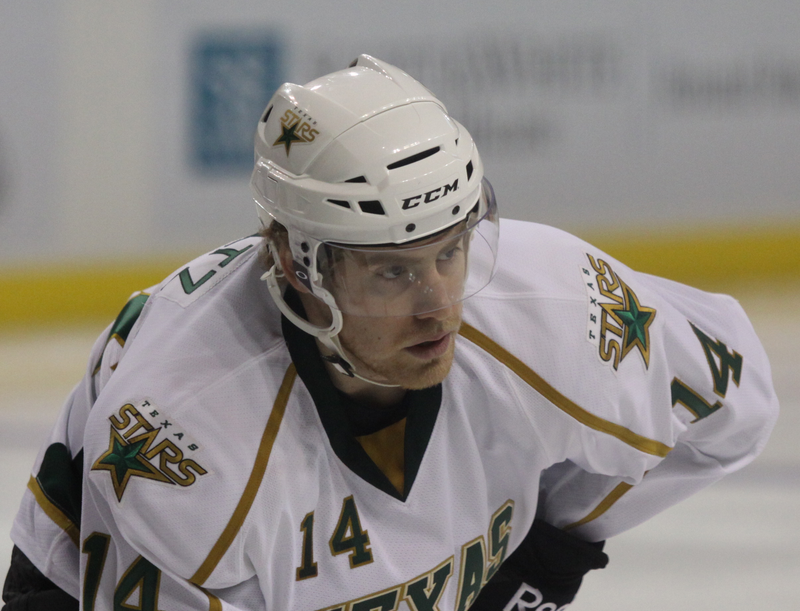 The Texas Stars announced two more signings today for the 2011-12 season, Stephen Schultz and Mike Hedden, both on standard player contracts. Stephen Schultz, who joined the team on an ATO at the end of last season, was actually signed before the end of last season for this coming year. This is the first initial announcement of that signing which I first reported on here. Schultz is out of Colorado College, the same school that produced Richard Bachman and former Star Scott McCulloch. Expect him to make the roster as I outlined in my season preview at the forward position. Texas also signed Mike Hedden to an SPC. The third year pro has spent time in the AHL in six games with Rochester, Rockford and Grand Rapids. 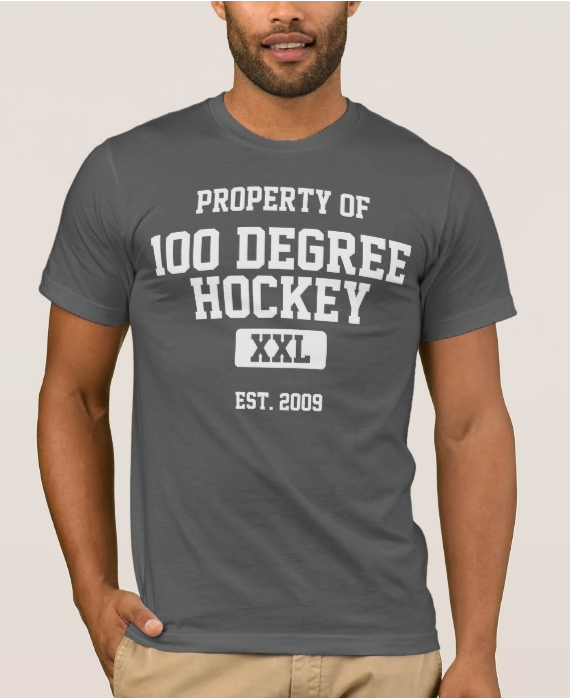 His stats are here on hockeydb.com. Hedden's signing will likely make it near impossible for a tryout player to make the team out of camp. The forward position now has 15 committed skaters for the coming season. Cracking that lineup is going to require a lot of effort on the part of a PTO. It's not impossible, but it's close. 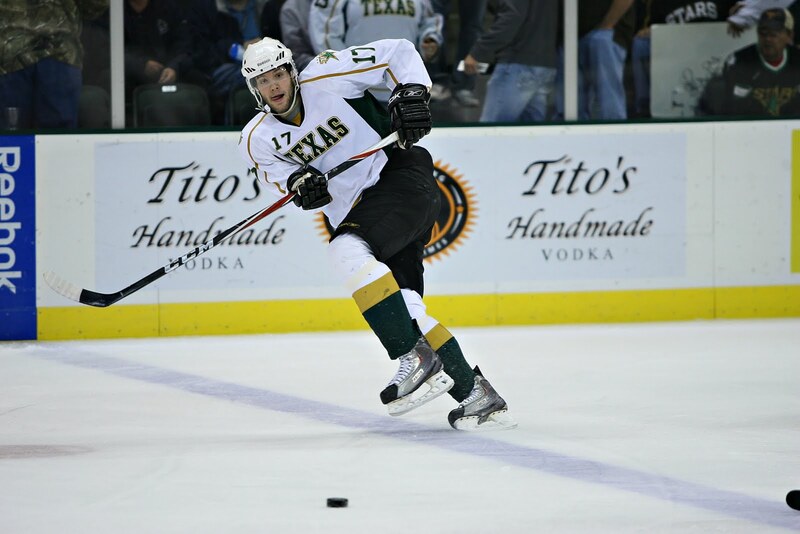 The Texas Stars announced on Tuesday the team has signed forwards Stephen Schultz and Mike Hedden for the 2011-12 American Hockey League season (SPC – Standard Player Contract). Schultz joined Texas in late March after concluding a four-year career at Colorado College from 2007-11. The 23-year old rookie played in five regular season games without registering a point for the Stars. The 5-foot-11, 190-pound forward posted WCHA highs as a senior in 2010-11, scoring 17 goals and totaling 45 points in 43 games played. In his final two years as a Tiger, Schultz set up 43 goals and totaled 65 points in 71 games. For his collegiate career, Schultz scored 36 goals and totaled 86 points in 127 contests. 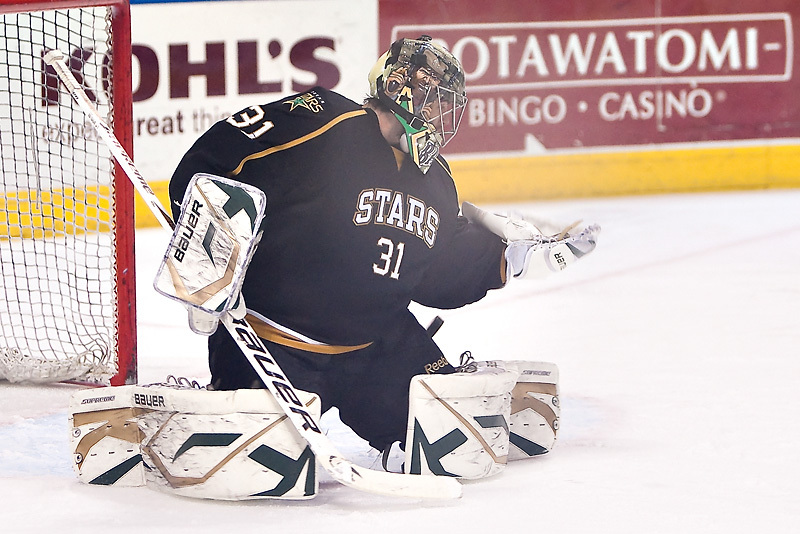 The rookie played with current Texas Stars goalie Richard Bachman at Colorado College. Hedden enters his third professional season after spending parts of the previous two years in the ECHL and AHL. In all, the 26-year old has played in six AHL games, split up between Rochester, Rockford and Grand Rapids in 2010-11. Hedden recorded a goal and two assists for three AHL points. The Dunnville, ON native also played in 57 games last year for the Toldeo Walleye of the ECHL. Despite playing in only 57 games, Hedden led Toledo with 32 goals and was third overall in points with 52. 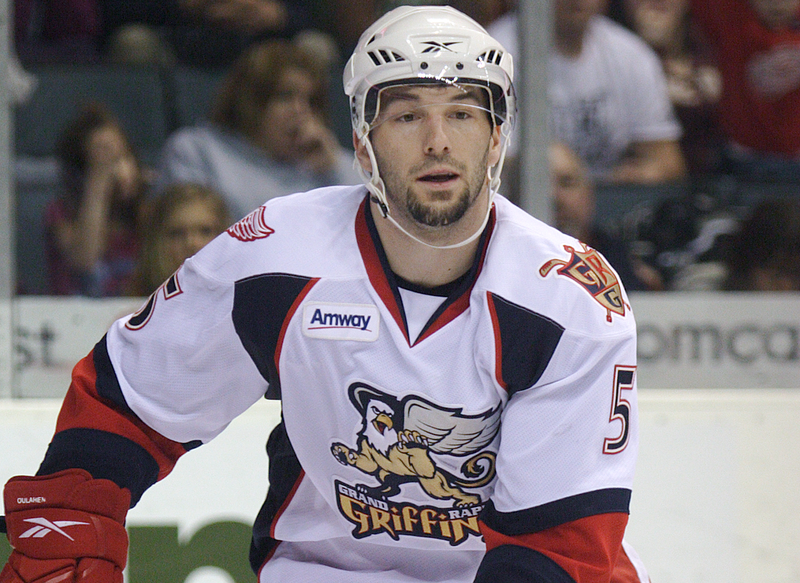 The 6-foot, 185-pound left wing spent his first season pro with Toledo in 2009-10. In his first season with the Walleye, Hedden scored 18 times and totaled 32 points in 66 games played. Prior to turning pro, the undrafted forward played four years at Neumann College, scoring 96 goals and picking up 163 points over 108 games from 2005-09. Former home of the Austin Ice Bats and current home of dozens of amateur adult and youth league teams, the Chaparral Ice, announced to its customers today that it will be closing its doors this winter. The rink, which has been for sale for "some time", is pending sale and will not continue on as an ice rink. According to the email, "Despite the Collins family’s desire that a future owner might continue to operate the location as an ice arena, this is not in the buyer’s agenda." While the sale is not yet finalized, it is expected to be completed on October 28th of this year. The rink will continue to operate until November 30th, at which point 2/3 of the public skating rinks in Austin will cease to operate. Beginning December 1, all skating operations in Austin will be consolidated to the Northcross location. The Northcross location features only one rink and just two locker rooms, which does not allow for teams coming on and off the ice to change simultaneously. Adult league game times could start as late as midnight on weekdays as a result of the change. There have been rumors that a new skating facility will open at FM 1431 and Parmer by August 2012. No confirmation of that story was possible at this time. The Texas Stars have used the Chaparral Ice at I-35 as a practice facility over their first two seasons in Austin when the CPC was unavailable due to other events. A rink at 1431 and Parmer would be likely used as a practice facility for Texas. Major changes are on the horizon for Chaparral Ice, and we want to keep you informed in as timely a fashion as possible about those that may affect your family. As you may know, the I-35 location has been on the market for some time. Currently, a potential buyer is in negotiations for the purchase of the site as a commercial property. Despite the Collins family’s desire that a future owner might continue to operate the location as an ice arena, this is not in the buyer’s agenda. Although the sale has not been finalized, we thought it best to tell you what we do know so everyone – management, employees, and customers – can begin to plan ahead. Should the sale of the I-35 location proceed as anticipated, the sale will be completed on Oct. 28, 2011. Chaparral Ice will then continue to operate as scheduled until Wednesday, Nov. 30, at which time the I-35 location will close its doors on an important era in Austin’s skating history. Beginning on Dec. 1, all rink programs will be consolidated at the Chaparral Ice Northcross location. As we merge the schedules of three sheets of ice into one, Chaparral Ice will make every effort to accommodate all our programs at the Northcross location. Every program offered and supported at Chaparral Ice is important to us and the success of all ice sports in Austin. However, there are only so many hours in a day, and every program and user group will need to make some sacrifices – specifically in terms of ice time available to conduct your normal activities. Chaparral Ice will be contacting each user group individually to discuss your needs and future ice availability. During the transition period, we will strive to keep everyone updated as to schedule changes and additional opportunities that may become available for your groups. The Austin ice sports communities survived, and indeed thrived, in a single, small facility for more than two decades (at the original Northcross ice rink). This situation can be manageable if we work as one and take into consideration the reason we all keep returning to the ice: We love to skate – hockey players, figure skaters, and public skaters alike. Thank you for your patience, patronage, and continued support as we glide together into the future. With the influx of Dallas players on the Texas roster this season, Cody Chupp and Sean Backman were both forced out of the lineup for the coming year. Today, news came out that both have found new homes for 2011-12. Chupp signed a deal with the Wheeling Nailers of the ECHL and will be on a tryout with the Wilkes-Barre/Scranton Penguins. Backman will be on a two-way contract with the New York Islanders, most likely playing with the Bridgeport Sound Tigers. Backman will join his brother-in-law, Matt Moulson, in the Islanders system. You can keep up with Sean on Twitter now as well, @SBACKS16. All this week, we have been taking a look at the Texas Stars expected roster for the 2011-12 season. As free agency has died down, the picture has become clearer as to who will make the cut on opening night. After covering goaltending on Monday and defense on Wednesday, we close today with the most variable group: the forwards. With the most players and perhaps the most turnover from opening night last year, the forward group in Cedar Park is the one that will see the most change from the prior season. First let's take a look at the forward lineup from the end of last regular season. From this group, there are some known subtractions. Greg Rallo (Florida) and Aaron Gagnon (Winnipeg) were signed away this summer in free agency. The Dallas Stars opted not to re-sign Sean Backman or Brandon Segal, and Texas is extremely unlikely to re-sign Mike Embach, Scott McCulloch or Cody Chupp. The additions to this point mostly come from players out of juniors or college. The roster already included Scott Glennie, the Stars top pick in 2009, at the end of the season last year. Joining him will bme Matt Fraser of the Kootenay Ice, a free agent signing from last season. Dallas also added Ryan Garbutt, a 2nd year player coming over from the Wolves, who played for Coach Pyle in Gwinnett for a short while at the start of the 2010-11 campaign. At this point, let's break down a likely lineup for the opening night, line-by-line. All three members of this line are signed on two ways to Dallas. Tomas Vincour spent the most significant time with Dallas last season at 24 games. Depending on how he performs in camp, he could start in Dallas and stay there. My inclination points to him starting in Texas and moving up at some point during the season. Travis Morin and Francis Wathier are more definite to start in Cedar Park, but would both be high on the list to potentially move up to Dallas when the need arises. Three more Dallas contracts make up the second line. Glennie got a bit of AHL experience at the end of last season, potting his first professional goal in the playoffs against Milwaukee. Ondrej Roman, who performed well but not outstandingly so in his rookie year, will continue his time in Cedar Park with first-year forward Matt Fraser. With the late re-signing of Sawada, this is a line that fans can look forward to seeing come over the boards. Combined in the mid-to-late season last year, these three are an energetic banging bunch that can gut it out in the corners but also score their fair share. As an energy line, they are a handful. The developing silky mitts of Tousignant and Sceviour are unexpected from such a rough and tumble crew. Expect this trio to take some teams by surprise yet again this fall. The ever-popular Luke Gazdic returns to play his trade after a strong second season in Cedar Park last year. His improvement in both scoring and defensive responsibility make him an important piece of a young fourth line. Stephen Schultz, who went to development camp in Dallas, is actually on a standard player contract to Texas, which was signed last season for this coming year. Finally, Dallas picked up Ryan Garbutt on a two-way deal out of the Chicago Wolves system. Garbutt showed a scoring touch (19-18-37) but also a strong plus-27 rating in 65 games. The last question is who makes up the reserve corps. Dallas has two players under contract who made occasional appearances in Cedar Park last season with Michael Neal and Tristan King. Neal has not shown enough to warrant consideration for the next-in-line role quite yet and will probably spend another season in Idaho unless he dazzles at camp. King was injured for most of last season and will likely do the same. I am looking for a player along the lines of a Greg Rallo or Travis Morin to come in on a tryout and make the club. Rallo and Morin, who were both pivotal members of the team over the last two years, were both tryout players. Late in September, we should learn more about potential candidates for this role. Texas announced today their three preseason games, to be played back to back to back at the end of September. The Stars will take on the Rampage on Friday, September 30th at 7:00 PM at the Cedar Park Center. Texas will then travel to the Rampage practice facility, Ice Center at Northwoods, for a 3:00 PM game on Saturday. Finally, the Stars will return home for a game against the defending Western Conference champion Houston Aeros on Sunday at 5:00 PM. Note that the Stars' preseason games are an always popular 3-in-3. Do not expect to recognize 90% of the names in these games on either side of the puck, by the way. Lots of tryout players will be on the ice for both teams. The regular season schedule should be announced within the next few weeks. All this week, we are going to take a look at the Texas Stars expected roster for the 2011-12 season. As free agency has died down, the picture has become clearer as to who will make the cut on opening night. After covering goaltending on Monday, we'll continue today with defense and close Friday with forwards. In terms of question marks, the Texas Stars defense corps really only has one. Returning six players from last season, the single issue that isn't resolved is who stays as the seventh man and who goes to Idaho. It is interesting to note that after having three players on standard player contracts last season (Stephenson, Benn, Spang), every defenseman this season is on an NHL deal. Let's break down the lineup. The 'first' pairing will certainly be the captain, Brad Lukowich, and second-year pro Philip Larsen. Larsen was thought to have potential to start in Dallas this season, but the signings of Adam Pardy and Sheldon Souray have given Dallas seven blue liners on one-way contracts. Larsen will be among the first called up in case of injury, but he will start the year in Cedar Park. Second is another redux from last season in Maxime Fortunus and Brenden Dillon. The young Dillon was balanced well by the savvy veteran presence of Fortunus at the end of last season and into the playoffs. Dillon will continue to grow into his role as a hard-hitting defenseman at this level while Dallas is sure to keep an eye on his development for a potential callup. Larsen and Dillon play very different games and depending on who is injured, one might be a better choice than the other. The third pairing is again one that was often seen at the CPC last season in Jordie Benn and Dan Spang. Both were on AHL deals in 2010-11 but upgraded to two-way NHL contracts this season. My initial worries about this line were that Spang's offensive forays would leave the rookie Benn vulnerable to quick tranisitions by opposing forwards. However, the two worked well together in their time on the ice and it has to be a pairing that is under consideration. Finally, the decision that is to be made. Hubert Labrie and Jace Coyle both finished their junior careers this past season and will be turning pro in the fall. One will stay in Texas, and one will go to Boise. Having not seen either play, there isn't the slightest indication of which one would be staying or going. Much of the decision lies with new head coach Jeff Pyle and GM Scott White. However, with Labrie and Coyle both being Dallas prospects, some direction could come from Joe Nieuwendyk's office as well on the matter. 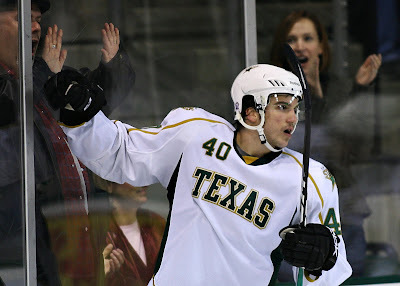 All this week, we are going to take a look at the Texas Stars expected roster for the 2011-12 season. As free agency has died down, the picture has become clearer as to who will make the cut on opening night. Today, we'll start with likely the clearest and easiest position to predict, goaltenders. Wednesday will be defensemen, and Friday will be forwards. 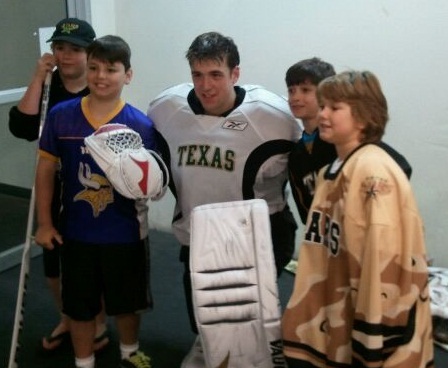 For their first two seasons, goaltending has been a position of strength for the Texas Stars. In 2009-10, Brent Krahn set records for the franchise with a 17-4-0 record, .945 SV% and 1.83 GAA, going 10-2 in the months of October and November before being struck down by injury. Matt Climie stepped in and performed admirably with a 2.46 GAA, .919 SV% and 21-17-3 record while Richard Bachman got his shots in, going 4-4-0 with 2.15 GAA and .932 SV%. The 2010-11 campaign continued that success for Bachman, who set a franchise record for wins with 28 in 55 games. Bachman posted a 2.20 GAA and a .927 SV%. Brent Krahn, who was supposed to be part of a 1A/1B situation with Bachman, was injured early and only played 12 games on the season. This made room for Tyler Beskorowany to enter the scene. The 20 year old, at the time, posted a 7-8-1 record with a respectable 2.58 GAA and .921 SV%. The only unknown in the Stars' goaltending comes in those emergency situations. If Kari Lehtonen or Andrew Raycroft are injured, Bachman gets called up and Beskorowany becomes your starter in Texas. But who is the backup? Last season we saw Adrien LeMay fill the 3rd goaltender role after Brent Krahn's injury. LeMay was signed by Texas to a two-way deal and spent most of the season in Allen, Quad City (CHL) and Idaho (ECHL). However, while LeMay spent many games with the Stars he did not play in a single one. If there is any disruption with any of the four goaltenders in Dallas or Texas, the Stars organization will need a serviceable 5th goaltender. This is one of those signings to watch for in the next month. Finally, when talking about the future of goaltenders in the organization, Jack Campbell must be discussed, if only because leaving him out would generate so many comments asking about him. Campbell will not be with the Stars this year. Campbell will continue his development in the OHL with the Spitfires this season and possibly join Texas in 2012-13. He could join the Stars or Steelheads as a 'black ace' toward the end of the season depending on how the Spitfires do in the playoffs as well. This would be the extent of his involvement in the season.